The aim of MY NAME IS OTHER is to conduct research, consult with experts and gather personal stories to inform the writing of a political text for a full-length production scheduled to run in London 2019. 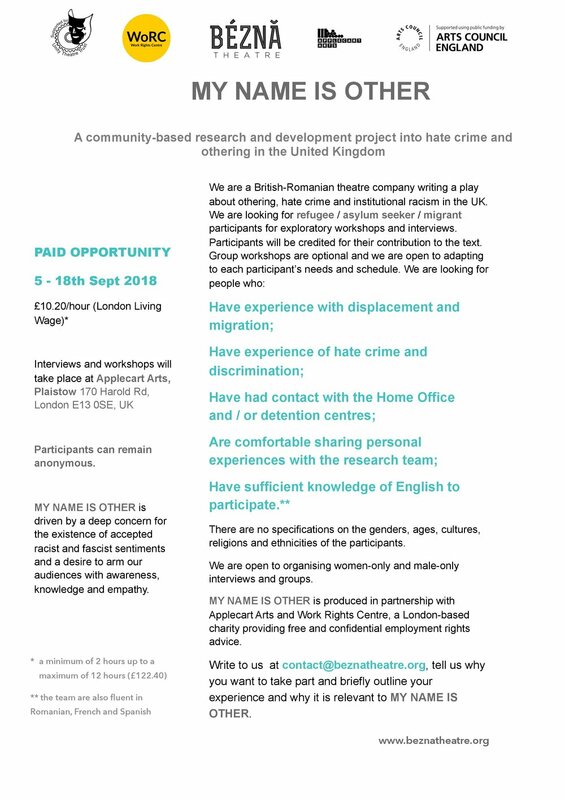 The text will be informed through community-theatre group workshops and one-on-one interviews with migrant and refugee participants alongside in-depth interviews and consultancy with field experts on displacement and racism. MY NAME IS OTHER will create a platform for marginalised and silenced voices in migrant and refugee communities to be heard and will offer the audience and participants an insight into the mechanics of scapegoating and othering, how national identity is formed by social, economic and political factors and will investigate how past and current right-wing ideologies systematically breed hostile environments for those most vulnerable. This project is driven by a deep concern for the existence of ‘accepted’ racist and fascist sentiments, and anger at the state-led normalisation of violence(s) against 'the other’. Our objective for MY NAME IS OTHER is to expose the state’s divide and conquer tactics and investigate its motives in order to arm audiences with awareness, knowledge and empathy. Our London-based interviews and workshops will take place at our partner spaces, Applecart Arts Theatre and Lewisham Refugee and Migrant Network. The R&D has informed the writing of ILLEGALISED. Find details for rehearsed readings and tour of the show here. Actors: Angel Carousel, Lizzie Clarke and Theo Green. Lewisham Refugee and Migrant Network, London-based charity providing free and confidential immigration advice on all aspects of immigration and asylum law. MY NAME IS OTHER has been supported using public funding by the National Lottery through Arts Council England. Other funding at the time of writing has been given by The Really Useful Group and the Unity Theatre Trust.